HCR's Founder and Chief Investment Officer, Mr. David Moenning, has been serving the needs of individual investors since 1980 and has been managing client portfolios since 1989. At HCR, we believe that diversifying portfolios not only by asset class but also by investing methodology, investment strategy, and time-frame is fundamental to long-term success, especially in today's fast-changing markets. For this reason, HCR's portfolio services employ a modernized approach to portfolio design via multiple investment management strategies and approaches. III. Manage risk - every single day! HCR offers a robust array of portfolio strategies. Below is a summary of the HCR offerings, sorted by what we call "Methodology Style Boxes" followed by an explanation of each portfolio series offered. Longer-term "core" asset allocation portfolios utilizing a capital market assumption approach. HCR offers 3 risk-targted portfolios that employ low-cost, tax-efficient NTF ETFs. Intermediate-term, global asset allocation programs utilizing a strategic, risk managed approach to allocation in terms of class under- and over-weighting. HCR offers 3 risk-targeted, strategic portfolios. Risk-managed portfolios that straddle both the strategic and tactical methodology lines. These multi-strategy, multi-time-frame portfolios incorporate both longer-term "core" holdings as well as leadership-based strategies. HCR offers 4 risk-managed, Stra|Tactical™ portfolios. Longer-term, tactically risk-managed portfolios designed to stay in tune with the primary market cycle and to manage the risk of the overall market environment. HCR offers 4 risk-managed, tactical allocation portfolios. HCR offers a risk-managed, multi-strategy, multi-manager, equity portfolio. The portfolio focuses on the top rated stocks in each S&P sector as well as industry leadership, and incorporates a hedging strategy during severely negative markets. Longer-term, strategic alternative class offerings. HCR offers 3 risk-targeted portfolios focused on the liquid alternatives space. 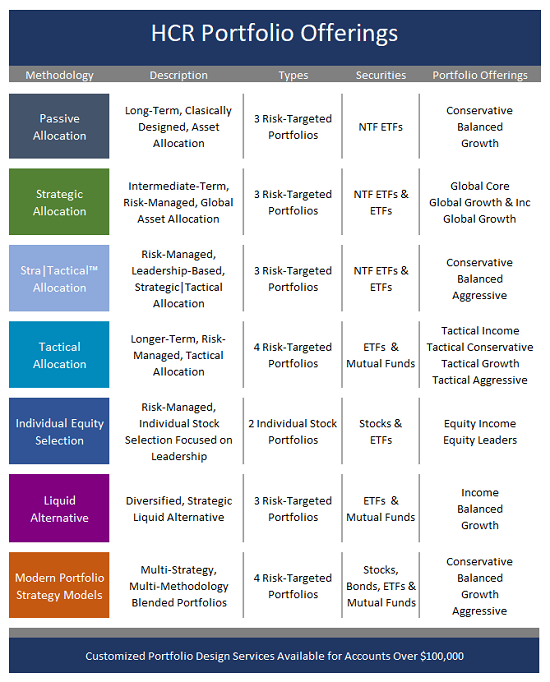 Portfolios utilizing a modern approach to diversification by employing multiple styles, multiple strategies, and multiple time-frames - all in a single portfolio. HCR offers 5 risk-targeted "modern" portfolio designs. For investors with over $100,000 to invest, HCR can customize portfolios to specific client needs and risk tolerance.